At OCP Summit 2019 later this week in San Jose, California, Molex and Innovium will host a joint demonstration combining Molex’s BiPass I/O technology with Innovium’s 12.8Tbps TERALYNX Switch ASIC. The companies say the new switch system design offers better signal integrity, thermal management and simple manufacturability, providing the end customer a highly robust and resilient system. Molex's low-insertion-loss, BiPass I/O technology serves as a PCB alternative to enable efficient and reliable implementation of 56 and 112 Gbps PAM-4 protocols. The BiPass cable assembly routes signals directly from an ASIC chip in a switch to the server front-panel I/O without having to go through the printed circuit board between them. Because the ASIC can be positioned farther back in the box, the BiPass solution allows for vertical orientation, providing greater port density. For further cost benefits, the BiPass solution reduces the number of board layers and eliminate the power cost and consumption of re-timers. From a thermal management perspective, the BiPass solution uses dual heatsinks, on the top and bottom of module, making cooling of 20W modules possible. At this week's OFC, Molex announced the general availability of its 100G Lambda product platform. Volume production starts in Q2 2019. Multiple 100GbE and 400GbE products will be offered such as 100G-DR QSFP28, 100G-FR QSFP28, 100G-LR QSFP28, 400G-DR4 QSFP-DD, 400G-FR4 QSFP-DD and 400G-LR4 QSFP-DD. In addition, Molex is showcasing the coherent product platform, which supports products such as OIF 400G ZR compliant transceivers in OSFP and QSFP-DD form factors. Molex is also hosting a joint live demo with Cisco, Innovium and Ixia that shows end-to-end Ethernet traffic through 400G-DR4, 100G-DR, 100G-FR and 100G-LR transceivers. The demo highlights the 100G Lambda Multi-Source Agreement (MSA) compliant technology’s readiness to support next-generation high-speed, high-density networking. Sharing the same optoelectronic technology, the 100G Lambda product platform is scalable to support future serial 100G and 800G products. 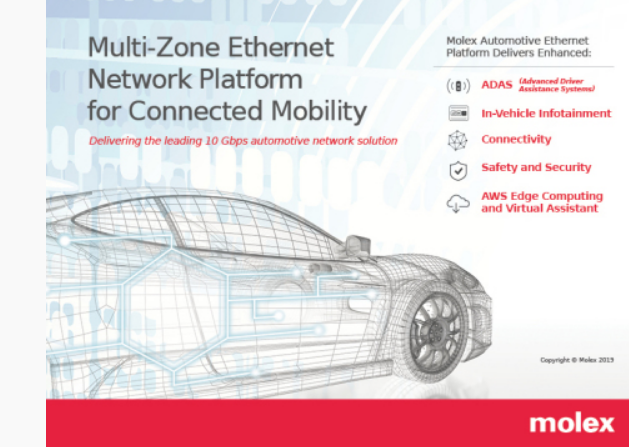 Molex will showcase the next evolution of its 10 Gbps Automotive Ethernet Network Platform at this week's annual Automotive Ethernet Congress (AEC) in Munich, Germany. At the system’s core is the Molex gateway, a secure networking hub that aggregates and processes data from all domains and devices, seamlessly integrating multiple hardware and software systems as well as legacy automotive protocols. Molex’s multi-layered security approach includes enhanced hypervisor capabilities that allow the platform to run multiple virtual machines and applications simultaneously, giving automakers more flexibility, while also providing powerful encryption and certification technology for a more layered and secure network. Safety enhancements include new multi-zone, fail-functional, and redundancy capabilities. The reliable interface necessary to seamlessly connect the high-bandwidth, data-intensive applications is the Molex HSAutoGig high-speed Ethernet cabling solution designed for greater vehicle autonomy, delivering best-in-class 20 Gbps+ data speeds. Molex will showcase these product at the upcoming DesignCon 2019 in Santa Clara, California. “Data centers must evolve to meet the rising demand for faster data rates. Molex delivers highly scalable technologies equipped with advanced features to achieve the speed, signal integrity, EMI containment and thermal efficiencies they need to ramp up to next-generation equipment and networking platforms,” said David Brunker, Molex technical fellow, who serves on the DesignCon 2019 Technical Program Committee. In addition to the booth demos, Molex will lead a technical session, “Exploring 56/112 Gbps Copper Interconnect Metrics Comparing Classic Methods with COM” on January 30th at 2:00 p.m. in Ballroom C.
Molex is working with Accenture and Amazon Web Services (AWS) to bring edge computing and voice assistant capabilities to the Molex Automotive Ethernet Network Platform for autonomous vehicles. The Molex platform is an Ethernet-based vehicle connectivity system with a multi-zone architecture across hardware, software and interconnect cabling systems, with the flexibility to incorporate legacy automotive protocols and scalability for future upgrades. It utilizes AWS IoT Greengrass machine learning functionality to enhance capabilities such as diagnostics, security and enhanced end-user experience. The future-ready, automotive-grade gateways act as central hubs, providing secure and reliable interconnects and processing data across the vehicle network to functional domains such as ADAS or Autonomous Driving. 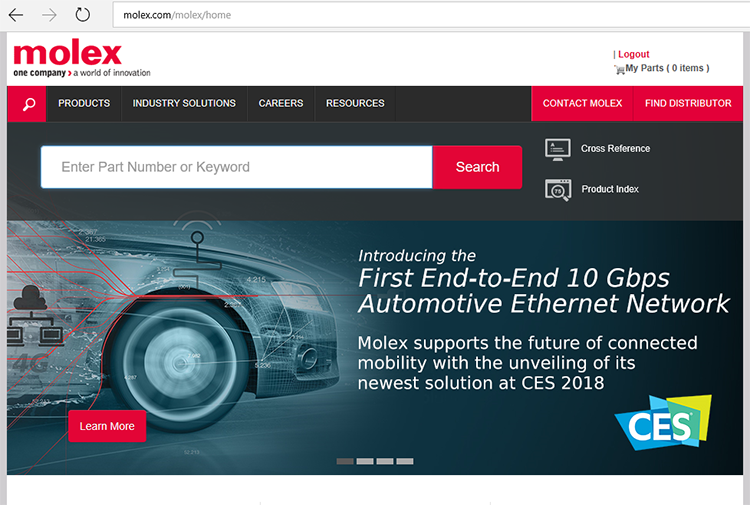 Molex introduced the next evolution of its award-winning 10 Gbps Automotive Ethernet Network Platform designed to support OEMs in the development and design of autonomous vehicles. The Molex HSAutoGig high-speed Ethernet solution is designed for greater vehicle autonomy, delivering 20 Gbps+ data speeds with a reliable interface necessary to seamlessly connect smart-sensor systems and Ethernet network platforms. The high-speed HFM FAKRA Mini Coaxial Cable Solution is designed to perform up to 20 GHz supporting autonomous and connected vehicle technologies. 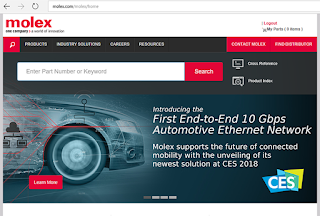 Molex said it is investing in the connected mobility ecosystem through internal innovation and ongoing and new collaborations with the automotive industry’s best-in-class technology service and solution providers including Accenture, Allgo, Amazon Web Services (AWS), Aquantia, BlackBerry (QNX and Certicom), Broadcom, Cypress, Excelfore, Laird CVS, Microchip, Texas Instruments, and Rosenberger. Molex’s multi-layered security approach includes enhanced hypervisor capabilities that allows the platform to run multiple virtual machines and applications simultaneously, giving automakers more flexibility, while also providing powerful encryption and certification technology for a more layered and secure network. Safety enhancements include new multi-zone, fail-functional, and redundancy capabilities. Molex USB Hubs and Media Modules support wired and wireless device-to-vehicle connectivity needs,including USB Type C. The advanced design considers cascading USB hubs via USB and Ethernet to optimize multiple devices connecting from the front to the back of the car. “In close collaboration with our OEM customers, we translated the need for a safe, secure, reliable and connected vehicle foundation into a high-performance computing network on wheels. By integrating features such as signal integrity, network traffic prioritization, system scalability and security, we have ensured that our solution addresses the demand for more in-vehicle processing power while helping automakers redefine what’s possible for autonomous vehicle technology,” states Dave Atkinson, director of business development, Molex. Molex is demonstrating its 100G FR QSFP28 and 400G DR4 and FR4 QSFP-DD products in compliance with the 100G Lambda Multi-Source Agreement (MSA). Both of the offerings are in Molex’s 100Gbps per wavelength PAM-4 product family which share the same optoelectronics technology platform. The 100G FR QSFP28 supports a 4x25G NRZ host electrical interface. The module transmits and receives 100G PAM-4 modulated optical signals over 2 kilometers of singlemode fiber. The technology variations can support different reaches such as 100G DR (500m) and 100G LR (10km). Aggregating four 100 Gbps per wavelength lanes, the technology platform will also offer 400G versions such as 400G DR4, 400G FR4, and 4x100G for breakout applications. Molex has acquired Nistica, a manufacturer of wavelength selective switching (WSS) products. Financial terms were not disclosed. Nistica, which was founded in 2005 and is based in Bridgewater, New Jersey, is a supplier of agile optical modules that simplify, automate and make affordable the delivery of high bandwidth applications for the global telecommunication markets. The company specializes in WSS, a signal routing engine for metro/long-haul telecom networks. Molex said Nistica's wavelength management solutions will enhance its portfolio of solutions for metro and long-haul networks. Nistica’s business will be integrated into the Molex Optical Solutions Group, a global provider of optical solutions, including a wide range of optical connectivity, optoelectronics, and optical transport products. Molex has acquired BittWare, a provider of computing systems featuring field-programmable gate arrays (FPGAs) deployed in data center compute and network packet processing applications. Financial terms were not disclosed. Bittware, which is based in Concord, NH, provides solutions based on FPGA technology from Intel (formerly Altera) and Xilinx. BittWare FPGA solutions are used in compute and data center, military and aerospace, government, instrumentation and test, financial services, broadcast and video applications. BittWare serves original equipment manufacture (OEM) customers. Molex and Rosenberger have signed a dual-sourcing agreement allowing Molex to produce High-Speed FAKRA-Mini automotive coaxial connectors based on the Rosenberger HFM design, which support data rates up to 20 Gbps. Rosenberger HFM FAKRA-Mini system is designed for a range of existing and future automotive applications, such as advanced driver assistance systems (ADAS), navigation, infotainment and intelligent connected vehicles. With the dual sourcing agreement, the companies provide a high-quality, high-speed, cost-optimized intermateable interface with identical mechanical and electrical performance and features. The solution delivers seamless backward compatibility for the automotive market. Molex introduced a portfolio of 100G and 400G products based on its 100G PAM-4 optical platform, including multi-Rate 25G/50G/100G PAM-4 DWDM QSFP28, 100G FR QSFP28, 400G DR4 and 400G FR4 QSFP-DD and OSFP. “Molex is a leader in the development of the foundational building blocks for 100G PAM-4 optoelectronics, and in collaborations for digital signal processing (DSP) integrated circuits. By leveraging these combined capabilities, we support high bandwidth requirements for a wide range of applications across intra-data center, data center interconnect (DCI) and 5G wireless. In addition, 100G PAM-4 technology also lays the foundation for cost-effective and high-density 400G solutions,” said Rang-Chen (Ryan) Yu, vice president of business development, GM of optoelectronic solutions at Oplink, a Molex Company and co-chair of 100G Lambda MSA. 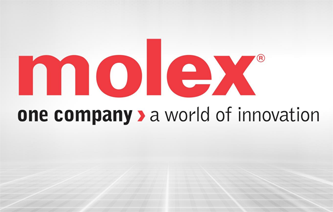 Molex Electronic Technologies has formed a subsidiary dedicated to investing in emerging technologies and companies. Molex Ventures specializes in investments and collaborations with startup companies that can leverage Molex design and manufacturing capabilities across a range of industry sectors, including Medical and Pharmaceutical sensors, connected health and point of care diagnostics; Automotive connected mobility, electrification and autonomous driving; Industry 4.0 sensors, robotics and data analytics platforms; and Electronics Packaging Technologies. Molex, a subsidiary of Koch Industries, has opened a technology center in Fremont, California. The facility will be one of the main innovation hubs for Molex Optical Solutions business and home to sales and customer development teams serving all of Molex customers in the region. The 108,000-sq. ft. building features over 50 miles of Molex Optical and Copper Cable Assembly Solutions, patch panels, adapter panels, modular office electronics and wire management tools. Advanced building capabilities include an intelligent, low-voltage Molex Transcend Network Connected Lighting System using a Power over Ethernet (PoE) LED lighting network to enable energy savings through sensor feedback. Molex announced it has expanded its zSFP+ Interconnect System to support 56 Gbit/s PAM4 channels in a stacked 2 x N port configuration, allowing next-generation Ethernet and Fibre Channel applications to receive improved signal integrity. 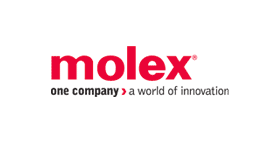 Molex claims the product is the first of its kind on the market, enabling OEMs requiring high-density interconnect applications now to utilise channels with individual lane data rates up to 56 Gbit/s PAM4. The updated Molex product also maintains a low insertion loss, crosstalk, thermal and electromagnetic interference (EMI) containment as provided by the previous generation zSFP+ interconnect system. The updated interconnect system offers multiple features designed to allow greater flexibility and lower costs for users. The 56 Gbit/s PAM4 channel products include EMI ganged cages, available in multiple port configurations from 2 x 1 through 2 x 12, providing flexibility of PCB signal routing of LEDs. Molex has also developed a next-generation terminal and wafer on the stacked integrated connectors within the zSFP+ interconnect system. The advanced terminal is designed to provide superior signal integrity for 56 Gbit/s PAM4 applications. The system also allows users to merge standard cables and modules with the increased data-rate accepted. The new zSFP+ interconnect system targets applications in cellular infrastructure, telecom equipment, switches, data networking servers and storage systems. * Recently, the SFP-DD MSA Group, which includes Molex as a founding member, announced plans to develop the specification for a high-speed, double-density small form-factor pluggable (SFP-DD) interface. The MSA plan to develop operating parameters, signal transmission speed goals and protocols for the SFP-DD interface, which expands on the SFP pluggable form factor. Excelfore specializes in middleware solutions for smart mobility networks that support next-generation smart, autonomous and learning vehicles, fleets and associated infrastructure. Excelfore automotive software products enable communication between automotive components and cloud-based servers, automotive fleet monitoring, and provision of Firmware Over the Air (FOTA) and Software Over the Air (SOTA) updates. Molex has acquired Interconnect Systems, which specializes in the design and manufacture of high density silicon packaging with advanced interconnect technologies. Interconnect Systems, which is based in Camarillo, California, delivers advanced packaging and interconnect solutions to top-tier OEMs in a wide range of industries and technology markets, including aerospace & defense, industrial, data storage and networking, telecom, and high performance computing. Molex said the acquisition enables it to offer a wider range of fully integrated solutions to customers worldwide. 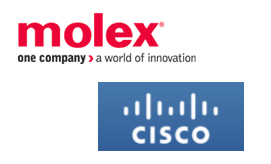 Molex and Cisco announced their participation in a multi-supplier agreement (MSA) to create high-speed, double-density quad small form factor pluggable (QSFP-DD), a new high-speed interface. Thirteen industry leaders have joined the MSA to collaborate in developing this new high-speed interface. The new QSFP-DD interface expands on widely adopted QSFP enabling systems to support backwards compatibility to existing 40 GbE and 100 GbE QSFP interfaces as well as a clear path to future 2x100 GbE and 400 GbE interfaces. By maintaining the same port density per rack unit, customers can speed up networks without redesigning the architecture. Molex has acquired SDP Telecom, a maker of RF/microwave solutions for the wireless communications industry. Financial terms were not disclosed. SDP, which is based in Montreal, Canada, has manufacturing facilities in China. SDP will be managed by the RF/Microwave Business Unit that is part of Molex’s Global Integrated Products Division.